Jews and Poles spent most of the first half of the 20th century at each other’s throats. Must they continue on the same destructive path as we head further into the 21st century? If you’ve been following the pointless controversy engendered by a foolish new law about the Holocaust that was recently passed by the Polish parliament, your answer to that question is probably in the affirmative. The legislation makes it a criminal offense for anyone to suggest the Polish people are in any way responsible for the Holocaust. Jews see this as an attempt to deny history and have responded with the outrage that is always engendered when the Holocaust becomes part of any contemporary debate. But what is missing from many of the comments from either side is any awareness of how wrong it would be if this debate is allowed to become a bitter addendum to the tragic history of Jewish-Polish relations that will drive the two peoples further apart after all they’ve both suffered. Phrased in that way, this is an attempt to deny the long history of Polish anti-Semitism, the fact that some Poles helped the Germans kill Jews as well as the hostile and sometimes violent reception Jewish survivors got when they tried to return to their homes after the war. Domestic politics is a big part of the answer. The current nationalist government thinks that whipping up anger about perceived slights to Polish honor is in its interests. At a time when many on the continent are understandably resentful about the impact of globalisation and the outsized influence of the European Union, of which Poland is a member, anger about the actions of Germans (past and present) or critics of Poland is a political winner. This is shortsighted and does nothing to help Poles resist Russian President Vladimir Putin’s attempt to reassemble the old Soviet empire that once counted Poland as a captive satellite. But as wrongheaded as this bill is, this is a moment for Jews to stop and think about the meaning of history and its implications for our lives today rather than merely venting knee-jerk anger over the Poles’ chutzpah. But even as they voice dismay at the new law, Jews would do well to remember the extent of the Polish suffering at the hands of the Germans. 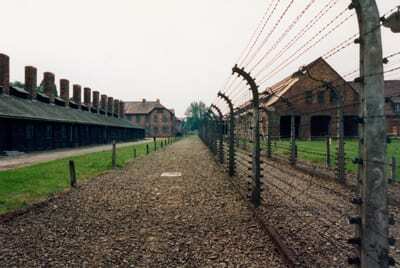 As Prime Minister Benjamin Netanyahu has noted, talk of “Polish death camps” is inaccurate. The phrase shifts blame from the Nazis who perpetrated the Holocaust to the invaded nation where the bulk of the murders took place. The Holocaust was the fault of its German perpetrators and their collaborators, not the Poles. The fact that the death camps were located in Poland was a function of logistics, not a belief that that Poles would help the Nazis kill Jews. Germans, not Poles, staffed the camps where many of the 3 million Polish Jews who were killed in the Holocaust died. The plight of the Poles under German occupation was not as dire as that of the Jews, all of whom were marked for death. But Poles were victimized more than any other occupied nation. At least 1.5 million Poles were deported to Germany for forced labor. Hundreds of thousands were imprisoned in concentration camps, and at least 1.9 million Polish civilians were killed during the war, including many who were murdered by Soviet Communist occupiers. The extent of Polish resistance to the Nazis must also be remembered. The Poles fought bravely against impossible odds both at the outset of the war and in 1944 when they rose against the Germans. That revolt was brutally crushed in a defeat that was enabled by the cynical refusal of the advancing Soviets to help and resulted in the deaths of more than 200,000 Poles. Though some Jews helped the Germans, many thousands also risked their lives to save Jews. Among them was Jan Karski, the Polish officer who brought word of the death camps to the West and was ignored by President Franklin D. Roosevelt. That doesn’t excuse the massacre of Jews at Kielce or at Jedwabne in 1941. But Jews who are quick to lump the Poles in with the Germans need to understand there is a reason why Poles consider themselves to be victims, not perpetrators. Moreover, Poland’s victimization didn’t begin in 1939, but stretched back centuries as the great powers treated it as a pawn in their wars and alliances. A willingness to dive back into conflict with Poland over the Holocaust ignores the enormous progress that was made to bridge the gap between the two nations in the postwar era. The heroic efforts of the late Pope John Paul II to combat endemic anti-Semitism both in his own nation and among Catholics everywhere deserve to be remembered with honor. The post-Cold War government of Poland also should be given credit for maintaining strong and friendly relations with Israel, something confirmed by its recent refusal to support the United Nations resolution condemning President Donald Trump’s stand on Jerusalem. Support for and interest in Jewish culture among Poles also testifies to the way Poland is changing. Jews and Poles don’t need to be enemies anymore. To the contrary, given Poland’s delicate strategic situation and the ongoing attacks on Israel, they have much in common. So rather than engage in mutual condemnations, Jewish critics of the new law should speak with the same understanding and compassion for Polish suffering and sensibilities that they demand for their history. The Polish Holocaust law is a foolish mistake. Like other nations, including Israel, they’d do better to avoid bills infringing even on hateful speech. But more than that, it would be a pity if arguments about history were to undo the progress that has been made to heal the historic rift between Jews and Poles.